Remember science in school? The periodic table, momentum, velocity and gravity... all just a little scary. Believe it or not, it's possible to put the fun back into the subject. 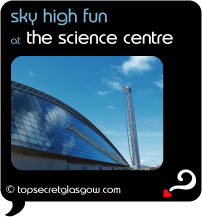 To have parents as well as kids desperate to have a try at experiments, to get a really good look at the galaxy, and to go on a wild adventure into space - without leaving Glasgow, of course. Wondering how? Check it out here - and when you go, don't forget your camera. Bon voyage. Uncover the best Glasgow has to offer by clicking through our top (secret) list below of special places... classics... surprises... all loved by locals. Every perky file bursts with the must-know info about each place to help you plan your trip... why should you go?... where is it?... how to get there?... when is it open?... how to book and get in touch?... and much more. Our community buzzes with shared stories and photos about these top places too - go have a look, and even grab your own page about your favourites. Nominations for the Top Secret Awards 2008 are now open - so make your vote count. Great news! Finding this page means you can now join our VIP list for SEE Science. Time to grab your very own page for SEE Science. So, if you are as big a fan as me, why not tell the world why this sort of thing makes you want to run open-armed and panting towards its front door. Big it up! Shout about it! Jump up and get down! Do you have a special story about a time you decided to SEE Science? A funny experience? A grand occasion? A funky photo? A personal tip? A top secret?